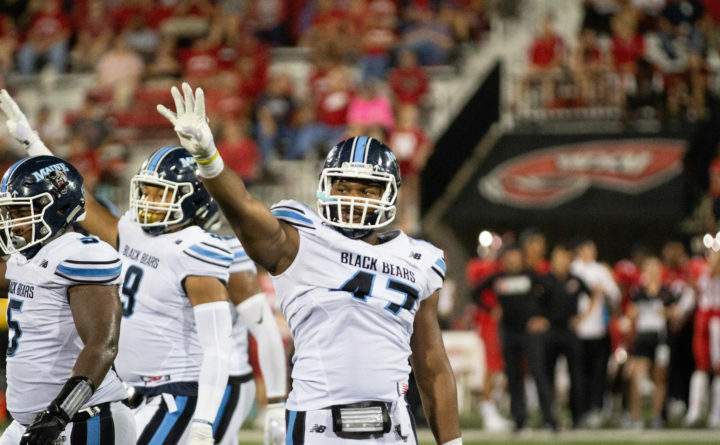 University of Maine linebacker DeShawn Stevens (right) and his teammates signal the start of the fourth quarter against Western Kentucky University in Bowling Green, Ky., on Sept. 8, 2018. 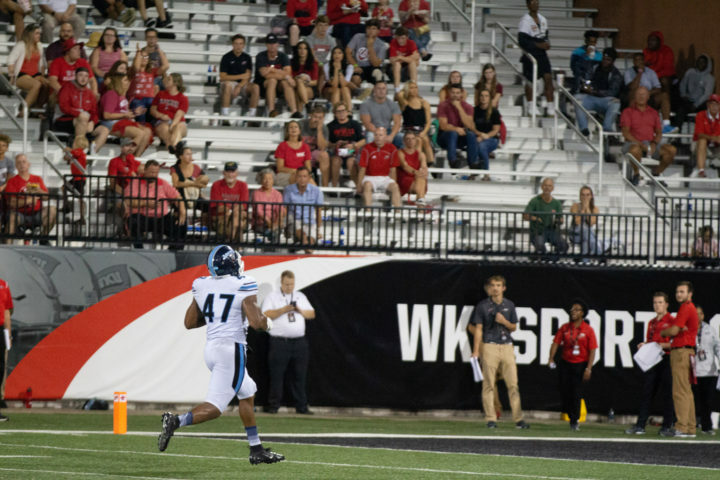 UMaine defeated Western Kentucky 31-28. ORONO — Andrea Anderson was scanning a summer activities catalog to find something to keep her fifth-grade son busy. “She said ‘What about football?,’” recalled her son, University of Maine sophomore linebacker Deshawn Stevens. “She said ‘OK, but if you don’t go to football, there’s no more TV in your life.’ I said ‘Never mind, I’m going to practice,’” Stevens said with a chuckle. University of Maine linebacker DeShawn Stevens returns a fumble for a 50-yard touchdown against Western Kentucky University at Bowling Green, Ky., on Saturday, Sept. 8, 2018. UMaine won 31-28. The 6-foot-1, 250-pound Stevens was the team’s fifth-leading tackler a year ago with 50 in 10 games including 4.5 for loss and 2.5 sacks. “Football gives me an opportunity to express myself, to get out the frustrations I have. It also gives me something to enjoy. I have fun with it,” Stevens said. “He was like a big brother to me,” Stevens said. “I followed his lead. He showed me how to approach a game, how to prepare yourself, watching film after hours and spending time with the coaches. Starting linebacker Jaron Grayer was slowed by a hamstring injury, but head coach Joe Harasymiak said Stevens’ impressive play during camp earned him the start. “The benefits have been far more than she ever expected for me,” he said.